Mainstays Over-the-Door Mirror, Black with Pewter, 17" x 53"
Add style to your styling routine with this Mainstays 17-inch by 53-inch over the door mirror. This Mainstays over the door mirror features patented no tools required technology that makes for an easy installation! This Mainstays black with pewter mirror can be hung easily over most any type of door without additional hardware or fasteners. The mirror is adorned with a classic black with pewter profile that will surely coordinate with any room d&eacute;cor. This Mainstays over the door mirror includes a set of over the door hooks that can be adjusted to four different lengths. In addition, each over the door hook has a white finish, which coordinates well with most doors. In addition to the over the door feature, this Mainstays mirror can also be mounted to your living room wall or bedroom wall. The actual full-length mirror measures 12-inch by 48-inch and the overall dimensions for this Mainstays black with pewter over the door mirror are 17-inch by 53-inch. 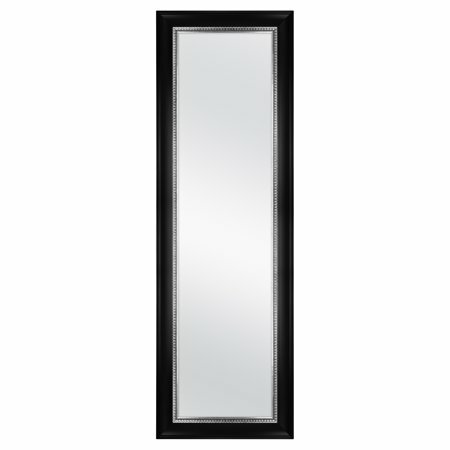 Add style to your styling routine with this Mainstays 17-inch by 53-inch over the door mirror. This Mainstays over the door mirror features patented no tools required technology that makes for an easy installation! This Mainstays black with pewter mirror can be hung easily over most any type of door without additional hardware or fasteners. The mirror is adorned with a classic black with pewter profile that will surely coordinate with any room décor. This Mainstays over the door mirror includes a set of over the door hooks that can be adjusted to four different lengths. In addition, each over the door hook has a white finish, which coordinates well with most doors. In addition to the over the door feature, this Mainstays mirror can also be mounted to your living room wall or bedroom wall. The actual full-length mirror measures 12-inch by 48-inch and the overall dimensions for this Mainstays black with pewter over the door mirror are 17-inch by 53-inch. Decent quality for the price and extremely well-packed for safe shipment. Nice looking also and would "fit" in a high-end bedroom as well as our simple-folk rooms. I just wish the hangers were a better "blend -in" color in relation to the metal borders. An excellent choice though for an over-the-door mirror! Perfect for space in your room with the optional over the door accessories. Extremely easy to attach to back of door. The only drawback would be if it were put on a door that is opened and closed a lot because it does move when using the door. Nice mirror, but could be nicer! The mirror is super nice, but I see now what other reviewers were talking about...with the back being almost non-existent...with it being SUPER thin "cardboard", if that's what you can even call it. I guess it's more like a thin poster board. I can see how that could create problems in the long run if you have to move it or something. Other than that, it seems to serve its purpose and looks much nicer than the standard cheapy $8 mirrors. Purchased for my 12 year old granddaughter. She enjoys having this and over the door is a good thing - no more holes in the walls. Very poor quality for $, arrived in bad shape. I needed an over the door mirror for my dorm room. This seemed like a good one for the price.. but it came in completely cracked and broken- barely wrapped in protection. the glass was everywhere inside of the box and it was barely a mirror- there was cardboard for support behind the cheap glass. this item was simply Beautiful except it was broken in a million pieces it been a week and I still haven't got my refund back. It took forever to arrive and once it did, I had to immediately process a return because the glass was smashed to pieces. Very disappointed.